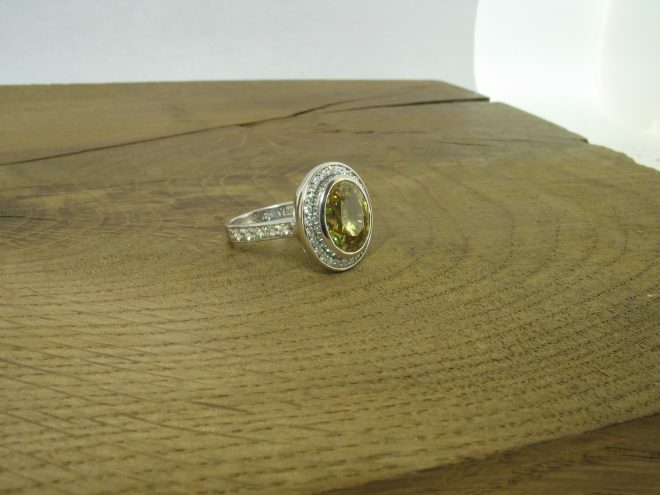 Yellow zircon bespoke ring in 18ct white gold. Yellow zircon and diamond statement ring. This was commissioned as a surprise, to re-create a favourite costume jewellery ring. The wearer loved the big statement of the huge yellow zircon, which weighs 8ct. Zircons are precious gemstones and should NOT be confused with cubic zirconia, which is a manmade product that imitates diamond. 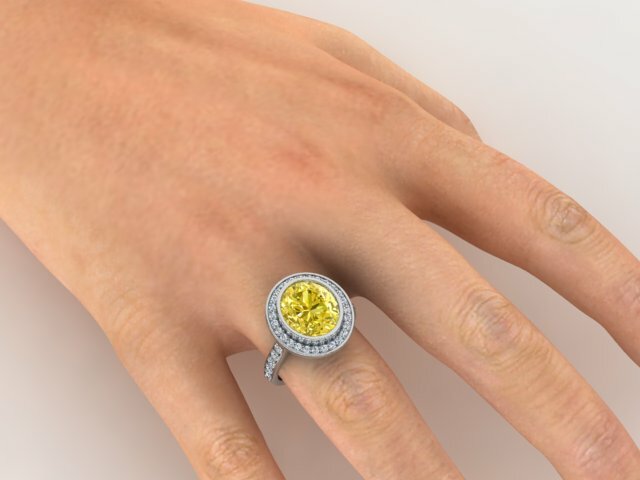 Real zircons carry a high value and are known for their brilliance. Zircons’ high refractive index and strong dispersion give the gems lots of fire and sparkle. Chemically, they are known as zirconium silicate (ZrSiO4) and fall under the category of nesosilicates. 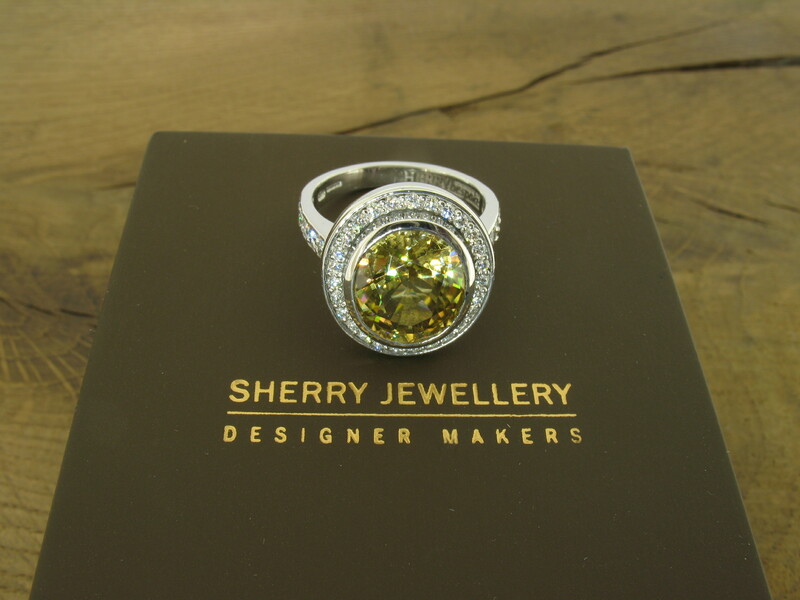 Zircons are naturally produced in many colours, ranging from reddish brown, yellow, green, blue and grey. 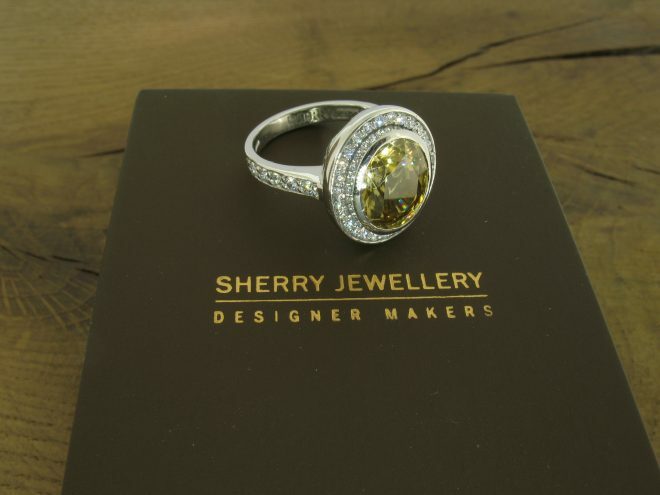 Our yellow zircon bespoke ring is a unique design, produced exclusively for the client. It is protected as a copyright design. We take great pride in our design flair and originality. Identifying exactly what is required for each commission and offering choice and control for each client. This enables our buyers to receive with a piece that is absolutely perfect for them. It’s a highly personal and precise service that delights all of our customers.